This is a tough nut for me to crack. I have a pre-existing condition, but if Divinity: Original Sin 2 can’t fix it, nothing can. I have a personal problem and I accept full responsibility for being wrong about this. 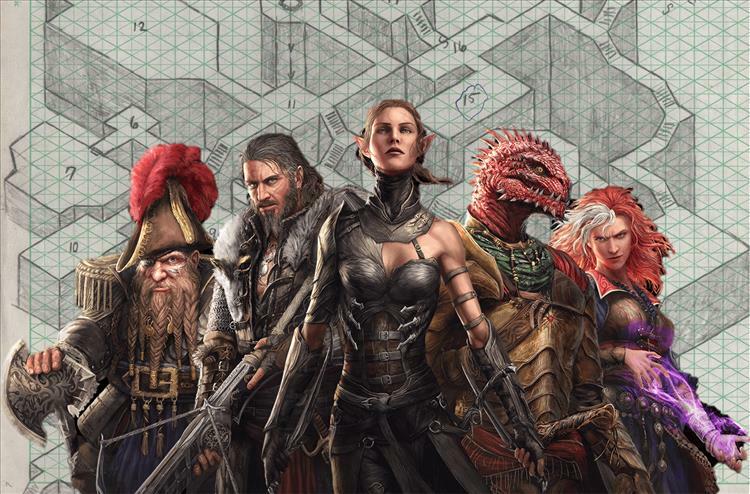 But my starting point is a difficult one when it comes to this sub-genre as a whole: the isometric party-based tactical role-playing game sub-genre. Let’s walk through that one a little bit. First: the isometric view is tough for me. That’s where the camera is about a 30-degree angle shot from above. A low bird’s eye view. I don’t like it. Staring at the ground feels claustrophobic. I can’t see the horizon, let alone the sky. Can’t see the forest for the trees; that sort of thing. Also, I feel weirdly deceived if, for instance, the fog of war reveals a 50-yard radius around me, but 55 yards away happens to hide an enormous castle or mountain range or dragon or whatever. I can deal with fog of war when I’m playing on a Civilization-sized world map. I get it when the details of the nation next door are still obscure. But when it’s the house next door? I don’t get that. Second: party-based. I was raised on pen-and-pad Dungeons & Dragons. Red Box era. So, it’s not like I don’t understand the importance of a party. The balance between rogues, wizards, and warriors. But maintaining one character sheet is a monumental task. So much page tearing, no matter how lightly you wrote or how gently you erased your ever-changing experience points, hit points, ability modifiers, copper coins, silver coins, gold coins, platinum coins. It’s tedious but a very noble cause. I love keeping track of a character’s strength, dexterity, constitution, intelligence, wisdom, and charisma. But keeping track of four characters’ ability scores? Four characters’ XP, armor, weapons, gear, profile sketches, and background biographies? No thank you. One is more than enough. Even though video games make it infinitely easier to track everything, it doesn’t mean I like doing it. There can be only one. Third: tactical combat. Boy do I love me some tactical combat—when there’s a grid-heavy map of squares or hexagons for me to move on. But when tactical combat is too freeform, when there’s too much freedom of movement, I feel…what’s the opposite of claustrophobic? Agoraphobic? (Apologies to people that live with these clinical conditions in real life; I’m being glib, and that's inappropriate, but I'm struck with a lack of better terms.) When I can move somewhere between three or four yards, or if that spends one or two action points, but none of that is definitive, then combat feels mushy, and mushy doesn’t feel tactical to me. Give me XCOM, give me The Banner Saga; give me, again, Civilization, or Endless Legend. Give me games where I can see those oh-so-comforting grid lines drawn on the ground, and where characters snap to that grid when they sprint across a field, hug to cover, or pop over a barrier. For tactics, I want Chess, not soccer. Also, congratulations, Original Sin 2, for somehow interweaving the two things that make me feel claustrophobic on one hand and agoraphobic on the other—shoegazing isometric views paired with grid-less tactical movement. So, that’s my starting point. Rest assured, however, that Divinity: Original Sin 2 – Definitive Edition feels very good. I feel good about it, rather. I just had to get those things off my chest so that you know where I’m coming from. I’m coming from a good place. One that appreciates tactical combat. One that appreciates RPGs. Perhaps I’ll never be completely in love with strictly isometric viewing angles, but two out of three ain’t bad. I'm making progress. These things don’t negatively affect my appreciation for the craft so readily apparent in Original Sin 2. It’s a good game. That much is easy to determine. It’s just time for me to broaden the ol’ horizons. I'm trying. And like I said, if Original Sin 2 can’t do it, no one can.